This is one of those books you just can’t put down: you are hooked from beginning till end. Tozer is past winner of the prestigious Gold Inky Award and has produced a rip-roaring read on so many levels. This book delivers in a rad way for YA readers and adults, too. 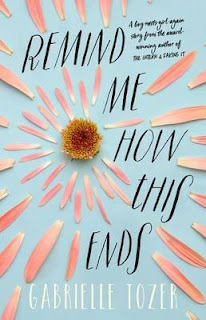 It is so much more than just a boy meets girl story, touching upon so many themes: love, friendship, change, grief, parents, the end of school, university, travel and survival. Staying true to yourself proves to be the hardest challenge of all. Milo is smart and clever but since finishing high school, he hasn’t been able to make a decision about the next step to take in life. He is left behind while his cohort is off at university, travelling and working. Milo is frozen with the inability to make a choice. He is stuck at home, in a small town working in his parent’s bookshop feeling pressured not to waste an awesome UAI and feeling like a loser. Sal his girlfriend is living away at uni, studying and partying hard. The gap between Milo and Sal widens more and more each day. Quirky Layla has suffered a great loss in life. She is back in town, hoping to find the grounding and healing that she needs. Milo’s older brother Trent is the loser of the family and is secretly pleased that the golden boy of the family is losing his halo. The characters are believable, annoying and lovable. This is a summer that starts in a tangled mess and ends leaving the reader wanting to know more about what happens in the lives of these teenagers. Keep your Fingers and toes are crossed and hope that Tozer writes a sequel to Remind Me How This Ends. This book would be suitable for ages 14+ years. Definitely, put it on your hit list for 2017 for teenage readers.